The 1975 plates held up better than expected and are to be used indefinately. The ABC-123 format is exhausted in February; 123-ABC format begins. All of these plates use 3 digits, instead of 2 for numbers 10 to 99. New base plate begins issue in February at 001-HEX. The number is in blue on white, with "TEXAS" screened in red at the top, "SESQUICENTENNIAL" at the bottom, and "1836 1986" & state outline in the middle. At around 240-LAE, "SESQUICENTENNIAL" is moved to the top, under the state name. Many non-passenger types adopt the Sesquicentennial design, with the slogan always at the bottom. In July, a new base plate begins issue with # 975-PAY. 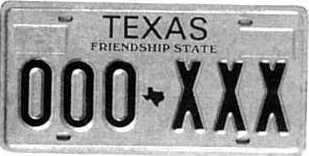 The so-called "red Texas" plate has a large red "Texas" over a blue number, with the state outline in the middle. Some counties begin issuing stickers with a black bar, denoting that the vehicle must conform to emission standards. Legislation is introduced to allow the state to produce special 14k gold-plated bronze license plates, available for an extra $1000 fee. The bill does not pass. A new base plate design is proposed, featuring a graphic image of bluebonnets, with the slogan, "Wildflower State". The design is rejected. Year of Manufacture law allows old plates to be used on antique vehicles, validated with a bolthole tab. The state adopts an 8-year replacement policy for renewable plates. After 8 years of use, new plates are to be issued. A new base plate design is proposed with the slogan, "The Friendship State". The design is rejected.